We left the Wharf Marina outside of Orange Beach, FL and headed down the Intercoastal Waterway heading for our destination to make our Gulf crossing, Apalatchicola, FL. On our way we stopped for a few days in Pensacola. We stayed at a marina right downtown, so we were able to walk to restaurants, shops and museums. Pensacola is a wonderful city. 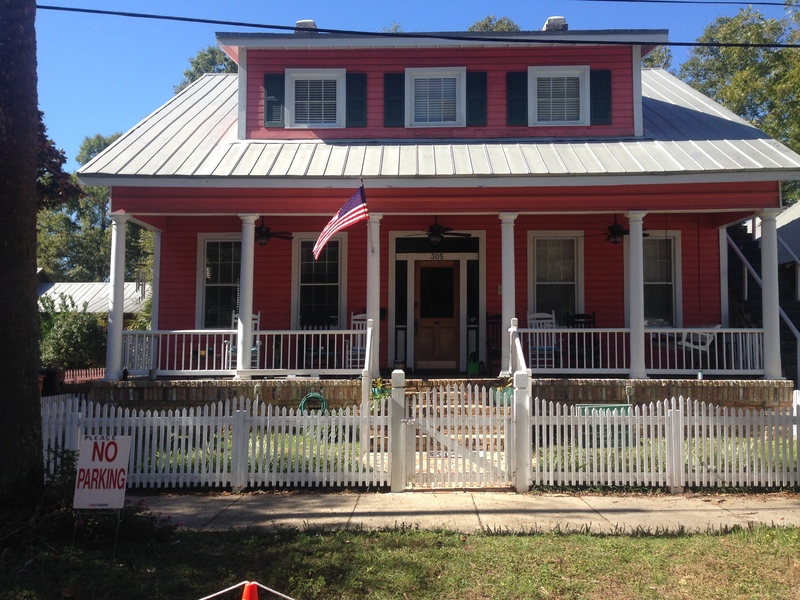 Vibrant, historic and youthful…..not just us old farts. 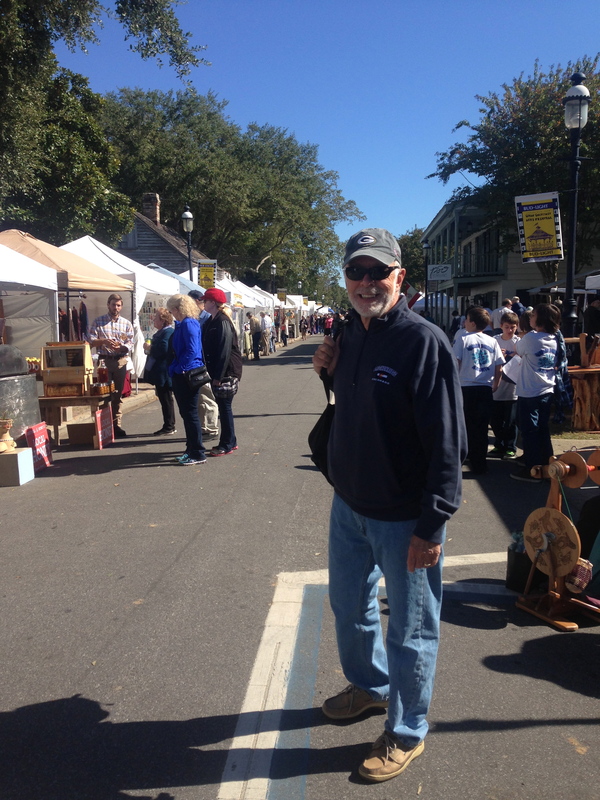 We were lucky while in Pensacola to experience a fabulous art festival. 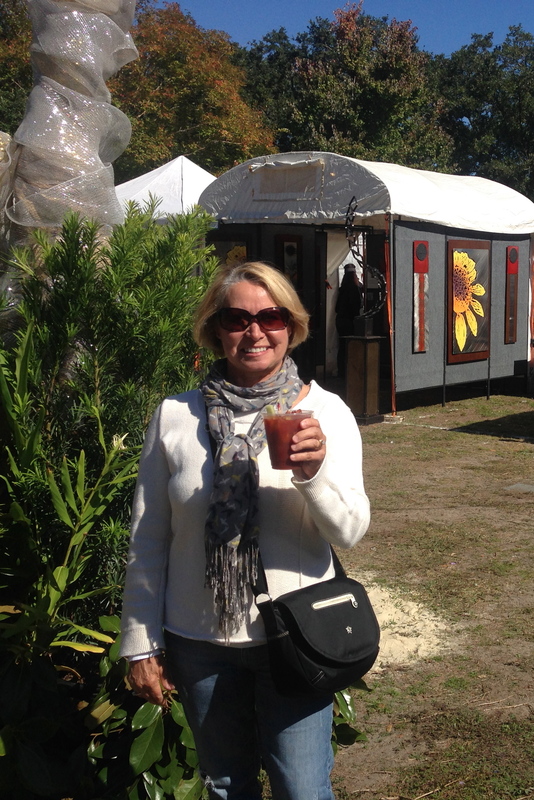 And, my kind of art festival it was – they served Bloody Mary’s!! How great is that! I think they try to get you loosened up to get your wallet out. We did buy one piece. Lots of great things – hmmmm, if only we had a house! Ming and Pema enjoyed watching the waterfowl in the marina. 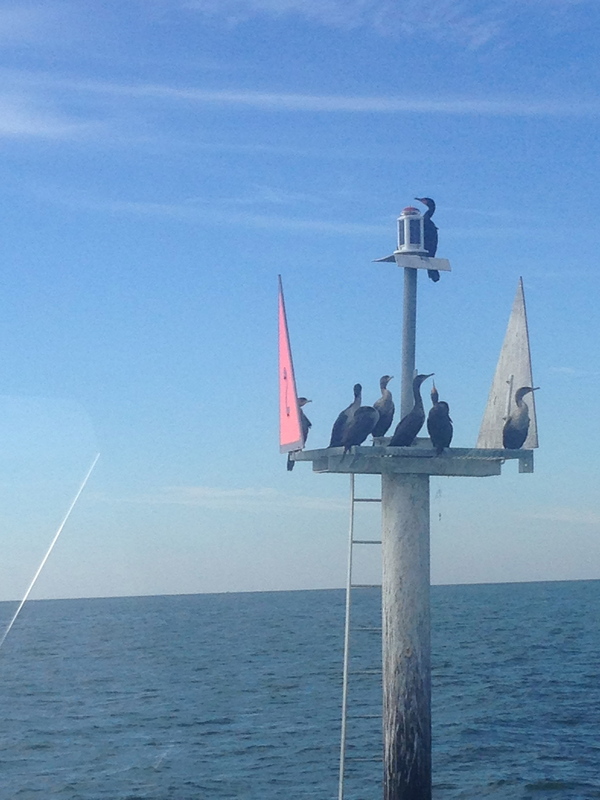 There were lots of pelicans diving in the water and also grey herons doing a little fishing. The next two days we worked our way further east along the coast. Primary undeveloped area with pine barrens and swamps. Spent the first night in Panama City, had supper at a funky over-the-water-on-stilts restaurant. Best sea food so far! We arrived at Apalachacola the following evening. Apalachacola is the jumping off point to travel from the panhandle to the peninsula part of Florida. The Intracoastal Waterway does not continue along this part of the coast because it is too shallow. The water is less than 6 feet deep and extends out 20 miles or so. Also, there are few rivers to duck into in case of bad weather. So most boats doing the Loop, except for very shallow draft ones, must head directly across, a distance of 200 miles (and most Looper boats travel at 8-9mph). As a result this is the most stressful (and probably dangerous) portion of the entire 5500 mile loop cruise for most boats. Most Loopers, rarely if ever, travel at night on the water. Add that to the fact that during the crossing you never see land, it is no wonder that the “crossing” is the subject of much discussion at Looper “docktail” parties. At 11:00 a.m. the next morning we began our crossing. The late start was to assure that we arrived at our destination in daylight. It took us about three hours to work our way thru shallow bays reach the inlet accessing the Gulf, where we were blessed by the weather gods with a partly cloudy sky, light following winds and fairly calm seas of 1-2 foot waves. 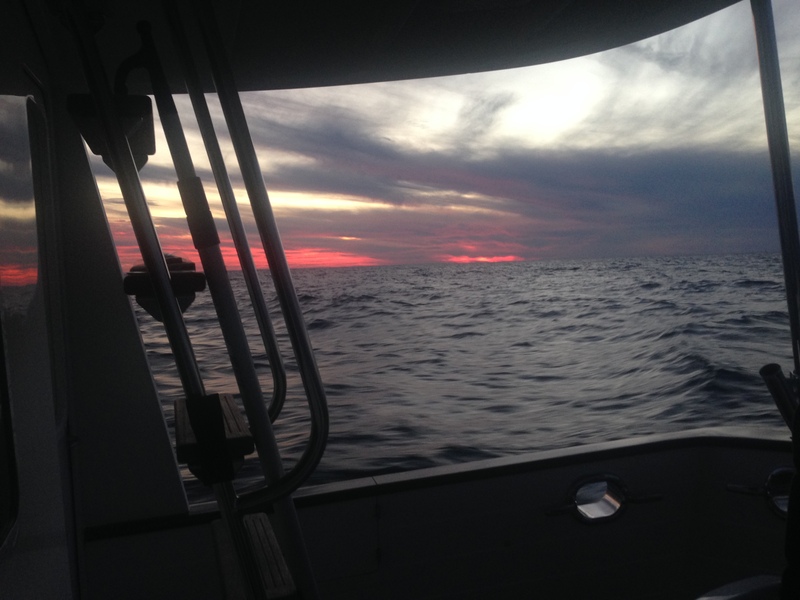 We began our crossing with two other “buddy” boats, one a 53′ Selene trawler and the other a 40′ Mainship. 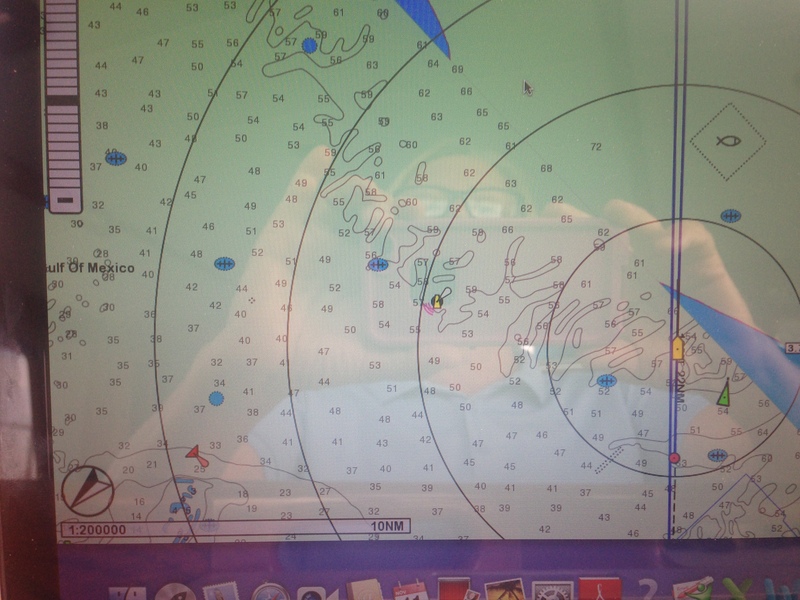 The Selene was actually heading to Bradenton, FL, so they veered off shortly after we entered the Gulf. The Mainship travelled with us all the way to Clearwater. The Mainship 40 traveling with us. We had a great crossing. What can I say, but “stabilizers” are a great thing. Stabilizers are computerized, hydraulic, “winglike” things that stick out below the waterline on the side of the boat, that sense the waves and move up and down to keep the boat more steady in the waves. With the waves behind us, it is the best of all situations for us; the boat not rolling much at all. We also have what is called a “full displacement hull” – much like that of a sailboat. Again, this means that our boat is much more stable than many “planing” trawlers. 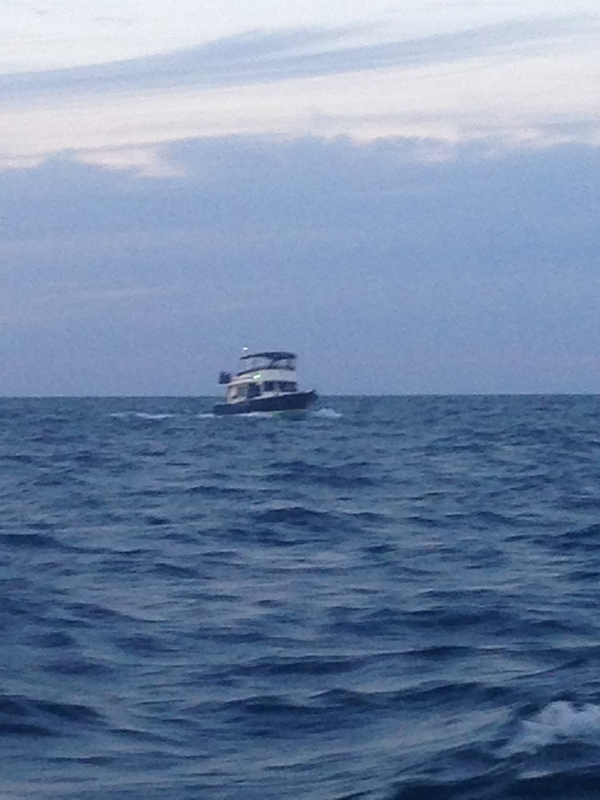 Case in point – the Mainship trawler traveling with us. This boat has almost a flat bottom. They were rolling a great deal even in the small waves. When we arrived in Clearwater, the three people on that boat were exhausted, whereas Mark and I were feeling pretty good for being on the water for 22 hours. 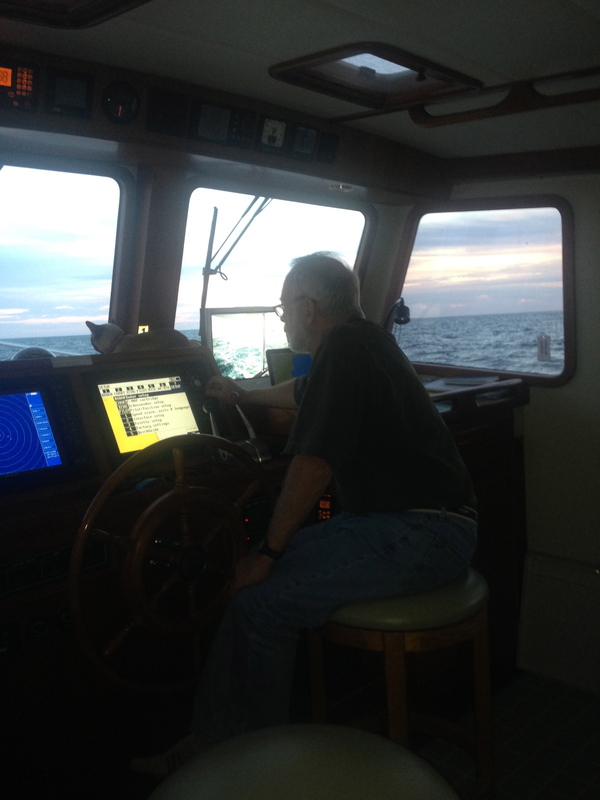 One of the crew members told us she had gotten sick and all three of them never left the helm station on the flybridge. She said all of them couldn’t wait until it was over. Mark and I took shifts at the helm – 2 hours on, 2 hours off until about 11:00 p.m. Then we did 3 hours on, 3 hours off during the night. For the most part, it is pretty boring but you need to keep your eyes open. You need to pay attention to what is going on around you, watching for any boat traffic on radar and watch the temperature gauge to make sure the engine is not overheating. 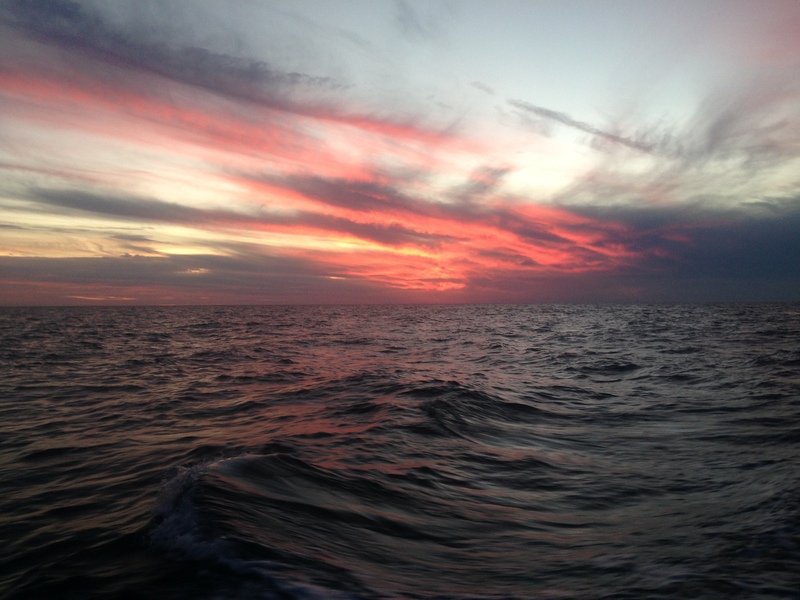 We kept in contact with the boat traveling with us about every two hours just to see how everyone was doing. One of the crew members of the other boat said to us when we arrived that they were so amazed at how alert and upbeat Mark always sounded on the radio, where they were so tired. Next Dance performed flawlessly for our crossing. We love our boat! We had planned to anchor off once we arrived, but Mark looked again at what time we would get in and what the tide situation would be. It turned out that it was going to be low tide and still too dark which would have made anchoring dangerous. 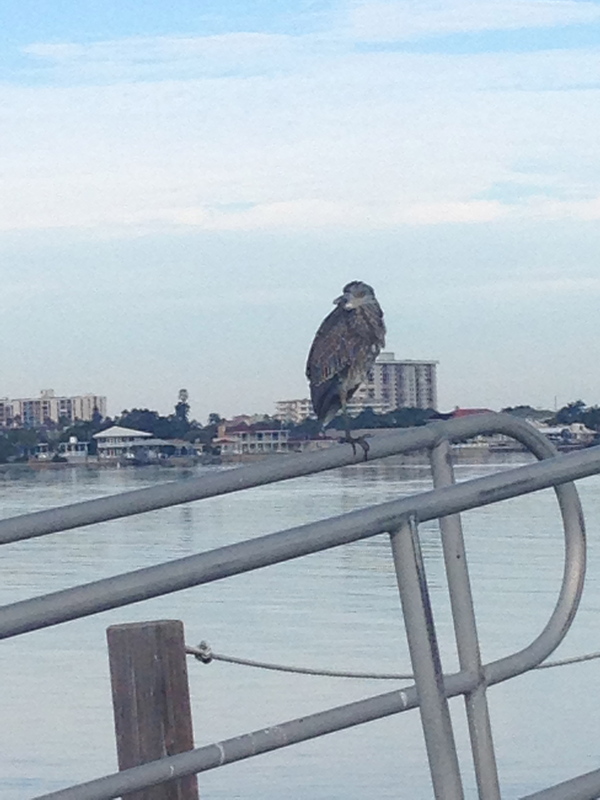 So we decided to go on to the Clearwater Municipal Marina instead, which was another hour and a half further south. A good decision. At about 8:00 a.m. we could see Clearwater, FL on the horizon. 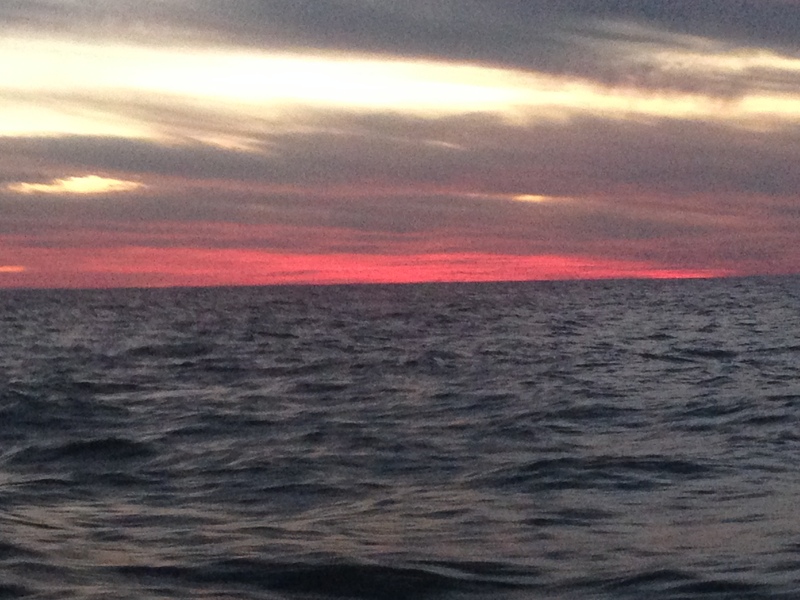 However, we couldn’t relax just yet – we had to dodge hundreds of crab pot floats as we neared Clearwater. Couldn’t they put those crab pots somewhere else?? 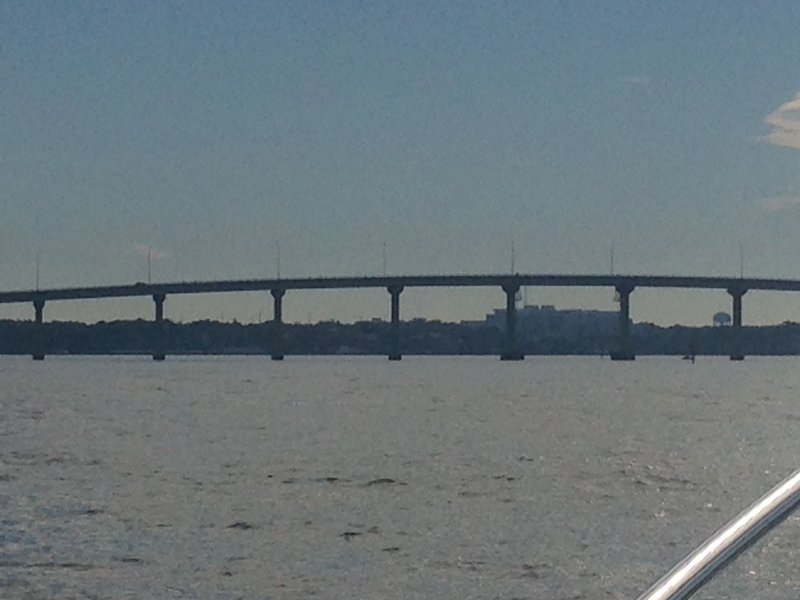 We went under the bridge and officially were in Clearwater! We wound our way through the channel to the marina and found our way to our slip. The largest slip they had available for us was 17′ wide. Our beam (width) is 16’4″. With our fenders out, we could not actually get in all the way. So we settled for going halfway in, with our stern hanging out 15ft or so. But it is not a problem, because there is lots of space behind. Once we settled in we had some scrambled eggs and a Bloody Mary to celebrate our smooth crossing and then we hit the pillow for a few hours. Slept a bit, then got up to get the boat reorganized. We walked into the downtown area to a great little Italian restaurant, then back to the boat to take a sleeping pill to make sure we slept through the night. The next morning we awoke completely refreshed! A great feeling. 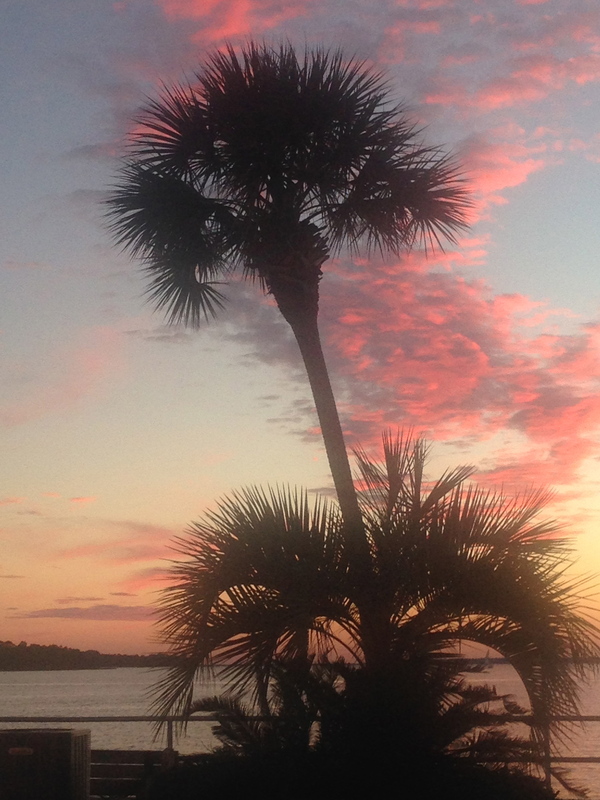 We liked Clearwater and the marina so much that we decided to stay a week. A great decision. Our slip in Fort Myers is not available until December 1, so we have time to smell the roses in getting there over the next couple of weeks. It is only 150 miles (by water) south of us. 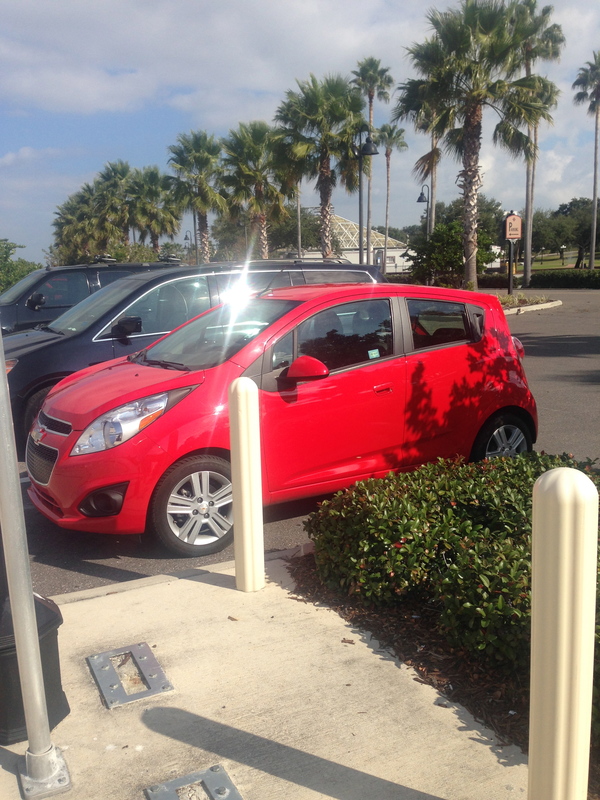 During our journey, we travelled some 800 miles, with a couple who live in Clearwater. They had a second home in Charlevoix, MI which they had sold. They were taking their sailboat, Morning Star, back to Clearwater where they plan to get it “prettied up” to sell. We called Dave and Cheryl to tell them that we had arrived in Clearwater. They were thrilled to hear from us. Obviously they are a wealth of information on where things are in the area. We had a wonderful dinner with them in Clearwater Beach area. It was great to see them again and catch up. They are one of the couples we had been traveling with for over a month from the Illinois River down to the Tombigbee River. We all bonded and had so much fun together. One of the other couples is still behind us, probably holed up in Apalachicola waiting for a weather window. Unfortunately it looks like that won’t happen until around 11/21. We were VERY fortunate to have had the two-day weather window to cross in good weather. The cold front that is hammering most of the country has reached the Florida panhandle bringing strong winds, high waves and temps in the 40″s. Although Apalachicola is a cute town, it is not a place where we would like to spend a week waiting for the weather to break. Mark has rented a car for the week and we went to a cute little town just up the road called Dunedin. We had a great lunch there. Mark found a barber to get a haircut while I explored the great shops. I found one shop in particular that was fabulous. So fabulous that the credit card company alerted Mark via text of my far too extravagant charge!! Damn – don’t they know that there are some things he doesn’t have to know about. 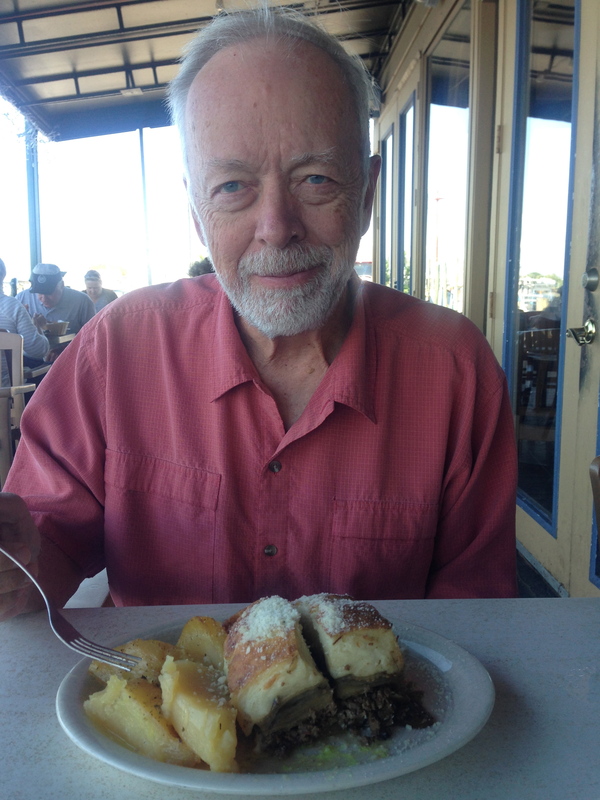 What can I say – it’s been awhile since I’ve been in “civilization”! A work of art that I just had to have! We have run errands, a day in Dunedin and a day in Tarpon Springs (where natural sponges are harvested by divers and home to many wonderful Greek restaurants). 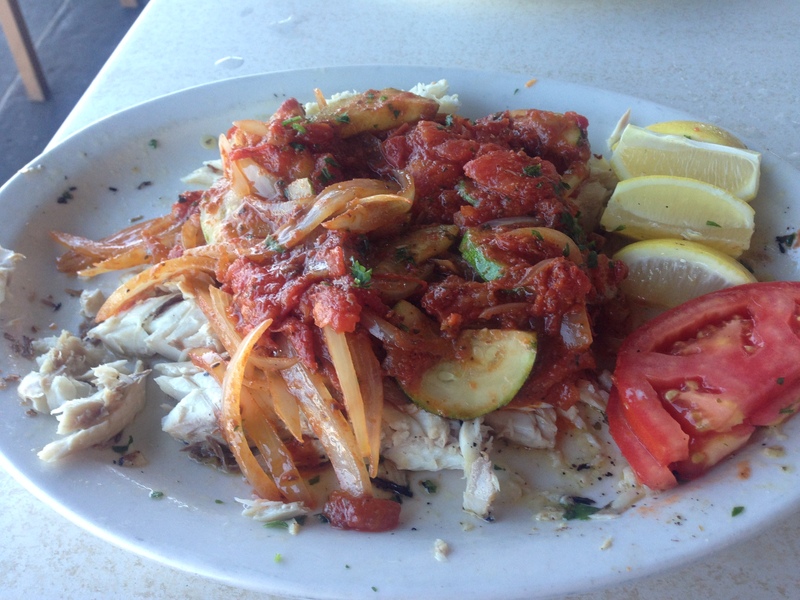 Fresh Red Snapper ala Plaka! The latest on Ming and Pema – we were happy that since our arrival that they had been staying onboard the boat. 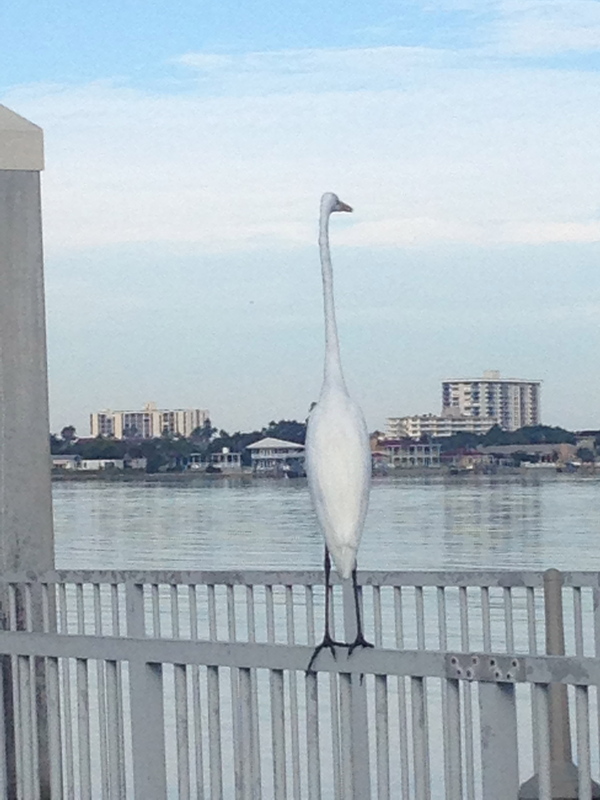 We think that is because they are a little freaked out by the big birds that wander the docks and the loud noises they make. Unfortunately, while waiting for Dave and Cheryl to arrive last night, I went inside to do something and darned if they hadn’t jumped off the boat! That little Ming, who I always thought was an angel – NOT! She kept running away from me, but at last I caught her. Pema – who is generally a little devil – was nowhere to be found. We spent 20+ minutes scouring the dock for her. 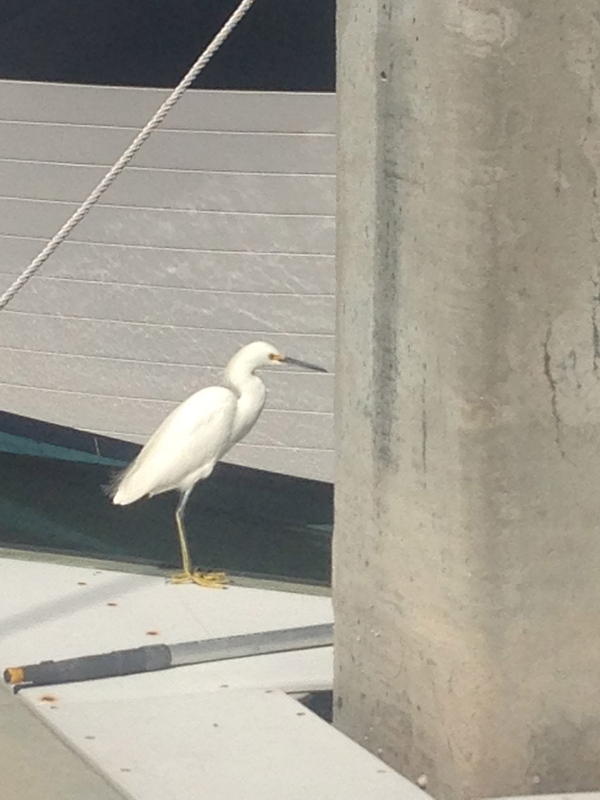 Even the dockmaster was helping us look for her. Finally, I went on board a boat moored across from us and there she was on the upper deck. Ugh! I think we need to get GPS chips installed on them! Well, that’s it for now. 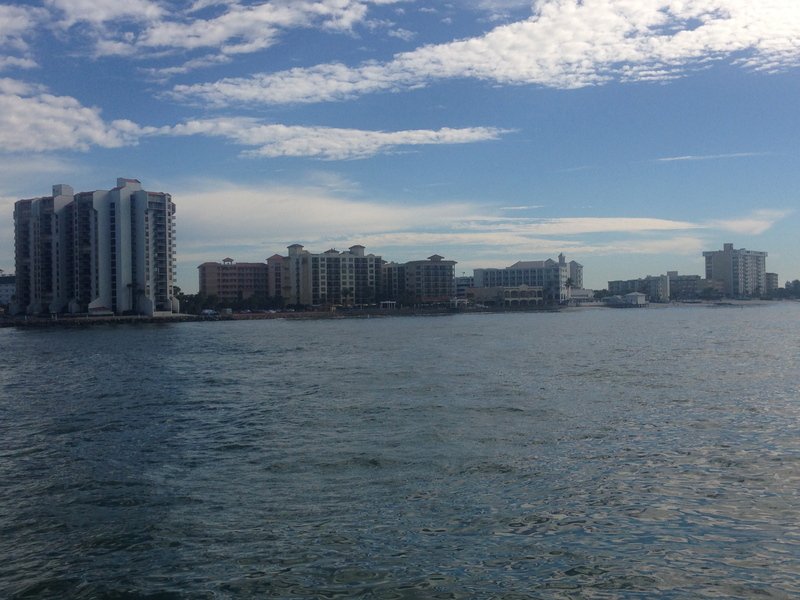 We will enjoy the time we have here in Clearwater exploring, eating, drinking, and of course a little more shopping! Until next time, let’s hope the market continues on it’s upswing so I can pay the credit card bills! 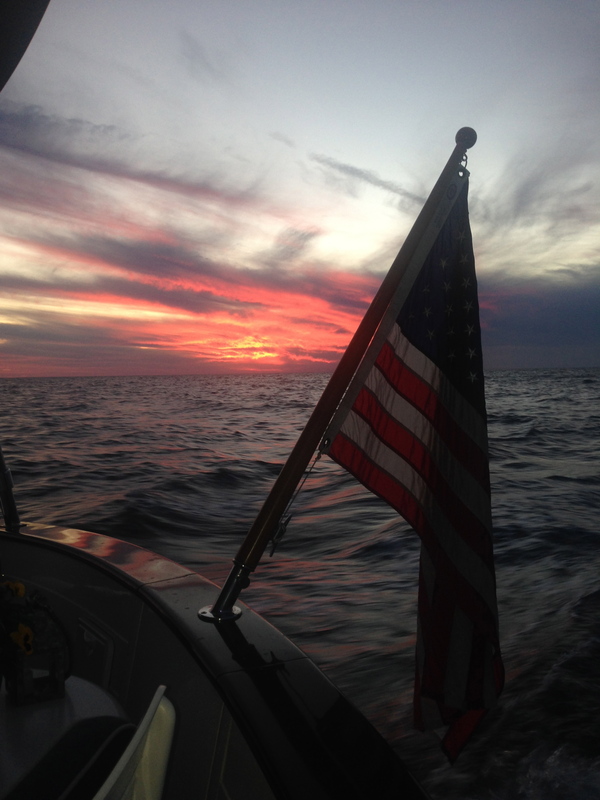 And, of course, fair winds and calm seas. I love reading about your adventures. I could write about my adventures here at wee cabin in Valley of the Sun. I’d have to put in stuff like, I spent 3 hours with the snowscoop pushing large amounts of white stuff around, and that was just the begining of the snowing….. Our littlest, newest mutt, Peanut cried this morning after she came in. Her poor little feet were frozen from her trip outside. The sun is shining now and the temps have risen from just below 0 to just above. It looks like a postcard outside. I’m enjoying the view from inside! First guest services day tomorrow, burrrrrr…..
Yeah, I must say I think I’m happy to be in this weather right now. Way to early to be so cold in the mountains. Please be sure to say hello to everyone. It sounds like some changes in Guest Services. Is Janet still there? I heard that Sandi went back to patrol. Enjoy skiing and the winter! Doggone it! You two are having way too much fun!!! One of our favorite vacations was on St. George’s Island many years ago – I envy you for all the delectable fish you are enjoying but do continue to spent a lot of fun filled days together. Hi Joanne! Yes, for the most part we are. 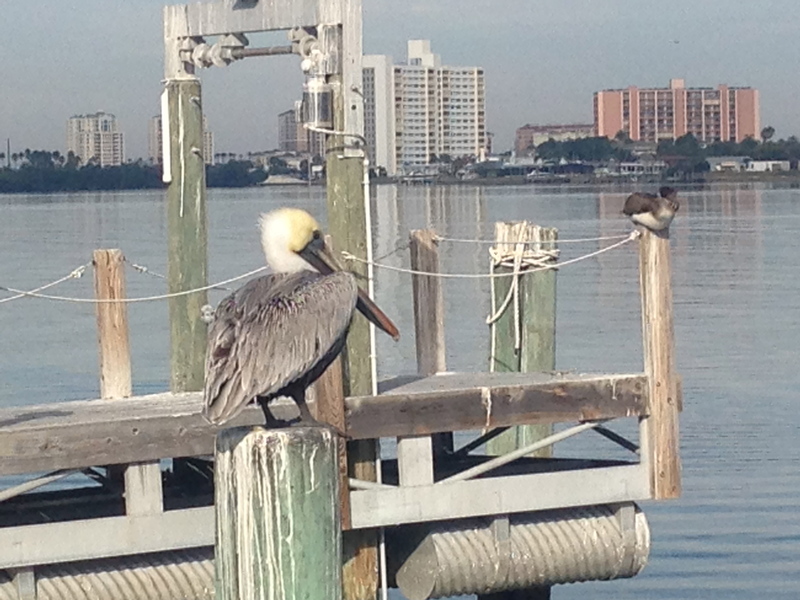 We were very glad to cross the Gulf and arrive in Clearwater. We really feel that we have “arrived” now that we are on the West Coast of Florida. Sounds like the weather back in Summit County is pretty nasty, so we are glad to be here. So sorry I missed Don’s phone call. I remember we were in the middle of something and I couldn’t pick up the call. Then I forgot to listen to the message or I would have called you back right away. Hope you have settled into your new home. Can’t wait to see it and YOU!! Best wishes, P.
Just read your most recent blog, and found that you are in our neighborhood. We live about 20-30 minutes straight across from Clearwater. Would love to see you and Mark. Here is my phone hm. 813-475-5200, or cell 727-482-4188. I hope you will give us a call, would love to see your new home on the water. A fascinating story that was really well composed. The dinners sound delectable. Cold here in Denver but lots of snow in the mountains. Going skiing in a few days. Hi Hamilton. Absolutely – I’ll give you my husband’s email. Mark Masuhr, email: masuhrm@yahoo.com I don’t know what your timeframe is, but we are actually putting our boat on the market in about a month or so. We love our boat so much, and the cruising lifestyle that we are having Kadey Krogen build us a 48AE. Mark has put together a spec sheet and can send you photos, but can also answer any questions you might have. We will be taking our boat from Fort Meyers over to Stuart next month, and then up to Annapolis where it will officially go on the market about mid-April.